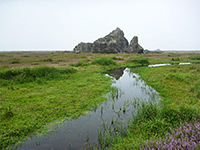 Prairie Creek is a relatively small drainage that enters the Pacific Ocean near Orick after flowing south through the redwood forests where it is followed for a while by the two lanes of the main California coastal highway US 101. 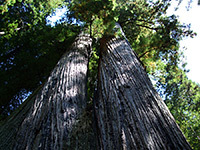 This bends away to the east at one point, but a narrower road continues by the creek and into the 23 square mile Prairie Creek Redwoods State Park, perhaps the best part of the coastal redwood region because of its beautiful and varied scenery, and the easy access. It is certainly the most developed park, containing around 60 miles of trails and offering many visitor services. (see map below) The one paved route across the park - the Newton B Drury Scenic Parkway - rejoins US 101 after 9 miles and so provides a scenic diversion on the north-south journey along the coast. From the southern junction it first passes a busy visitor center complex built next to Elk Prairie, a large meadow often frequented by a sizeable herd of Roosevelt elk. Black bears and mountain lions may also occasionally be glimpsed, and though hostile encounters are very rare, the park was closed for several days in January 2007 following a lion attack on a visiting couple. Other facilities in the area include a campground, bookstore and picnic area. Several long hikes begin at the prairie, some following the Prairie Creek valley northwards, on both sides of the highway, and others crossing the hilly land between here and the ocean, which lies just 3 miles to the west, though completely out of sight. North of the visitor center the road passes various named groves of redwoods and trailheads for other, shorter paths including one interesting route (the Ah-Pah Interpretive Trail) along the course of an old logging track, since removed and the ground re-landscaped. 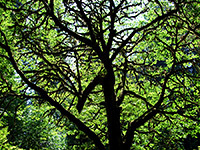 In general the parkway seems relatively little traveled apart from the southernmost section around Elk Prairie and is very atmospheric, well shaded by the huge trees that grow close together and sometimes protrude into the road rather alarmingly. Two other roads through the redwood forest are the Coastal Drive in the north, a narrow route (not for RVs) that parallels the coast staying some distance above the ocean, before eventually descending to the mud flats around the Klamath River, and the Cal Barrel Road in the south. This is a dirt track, even narrower and little used, which winds uphill a few miles through thick forest. 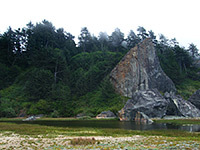 Despite the magnificent redwoods along the scenic drive, for many people the highlight of Prairie Creek Redwoods State Park is a visit to the beach. To get there, take the unpaved Davison Road, a narrow, twisting track that leaves US 101 three miles south of Elk Prairie and reaches the coast after 4 miles. It is quite a well traveled road, receiving enough traffic (during dry weather) to create lots of white dust that covers all nearby leaves and grass, creating a rather strange scene. The track opens out suddenly to the sandy shore, quite a contrast to the enclosed, dense woodland - the beach is often misty and cold, pounded by big waves and interrupted by piles of ancient whitened logs, washed up by harsh winter storms. Elk are often sighted here as well. A small day use fee is charged (unlike the rest of the state park, to which entry is free), and extra is due to use the windswept campsite further up the beach. There is a good selection of footpaths in this part of the park - the Coastal Trail along the sands, and many leading into the woods either along valleys or up hillsides, such as the three described below. All other trails are described in the hiking guide. 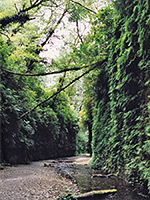 The vehicle track extends north for several miles further, beneath sheer sandstone bluffs, across a small stream and ends at the base of Fern Canyon. This is a beautiful box canyon - for half a mile it has a flat floor with a small creek running through, sheer sides covered with ferns and occasional large fallen logs across the streambed. 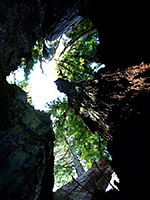 Huge, overhanging trees grow high above on the canyon rims, blocking much of the sunlight and creating a moist, cool, well-shaded environment. The hike through the canyon is very popular but only to the point where the walls become less vertical - after here, more light can enter and the way ahead becomes more overgrown. Most people return on a loop path close to the northern rim, and it is well worth walking right to the edge for a glimpse down into the leafy canyon. The return loop from Fern Canyon is also the end of the James Irvine Trail, a much less traveled route which follows the creek, crosses a ridge then runs along another creek to the park visitor center. The forest en route alternates between dark, enclosed sections and quite open areas where big trees have recently fallen, and such is the case after about half a mile where the path leaves the main valley and bends around a tributary ravine, crossing on a footbridge. There is no official path down, but an entry point nearby does lead into the canyon which upstream becomes very narrow for a while, reminiscent of the slot canyons of Utah with curving eroded channels through sandstone conglomerate, small pools and cascades, and sheer sides. Often the streamway is more like a tunnel as dense vegetation and fallen logs cover the top. Another route from the beach into the forest is the Miners Ridge Trail, a 5 mile path that also ends at the visitor center. It begins quite straight and level, alongside a small stream and through a relatively sunny valley with no large redwoods at first, not until a mile or so when it turns up a side canyon and starts to climb the hillside. Then the trees grow large, the sunlight decreases and the surroundings take on a more mysterious aspect - this is a particularly dense, Tolkienesque part of the forest. The path winds around side canyons and up some steep slopes then after about 2 miles leaves the valley and crosses a more open area, later descending into another valley and finally meeting the scenic parkway. The scenery is monotonous in some ways but always impressive. The nearest major city with hotels is Crescent City, 25 miles north, though the small town of Klamath (5 miles north) also offers lodging; a recently constructed Holiday Inn Express. For trail descriptions, see the hiking index.